Vinyl reissue. 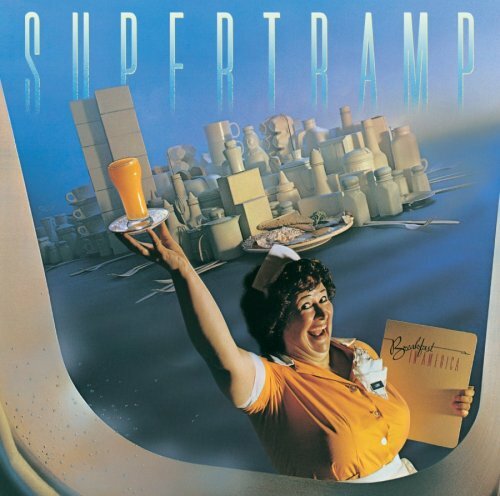 Breakfast in America was the sixth album by the band Supertramp, released in 1979. It was recorded the previous year at the Village Recorder in Los Angeles. The album featured four hit singles: "The Logical Song" (#6), "Goodbye Stranger" (#15), "Take the Long Way Home" (#10), and the title cut (#16). The album's front cover was designed by Mike Doud and depicted Kate Murtagh as a Statue of Liberty figure with the twin World Trade Center towers appearing as two stacks of boxes and the plate of breakfast represents Battery Park, the departure point for the Staten Island Ferry.